The Philippines’ Unakabogabol Star (indomitable star) Vice Ganda will continue to spread love and laughter in Asia, as his phenomenal concert series “Pusuan Mo si Vice Ganda: Nagmahal. Nasaktan. Nag-concert.” goes to South Korea. 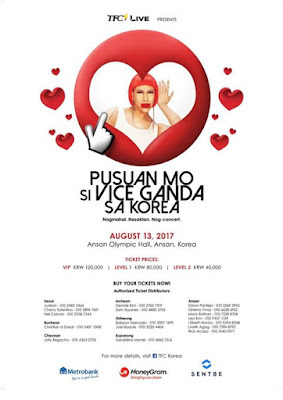 Following the success of Vice Ganda’s concert in Japan, the first leg of his tour outside the Philippines and within Asia, the “Pusuan Mo si Vice Ganda sa Korea: Nagmahal. Nasaktan. Nag-concert.” will happen on August 13, this time at the Ansan Olympic Hall, Ansan, South Korea. Aside from Vice Ganda, concert-goers will have a taste of homegrown humor from his “It’s Showtime” co-host Ryan Bang, and comedians MC Calaquian and Lassy Marquez. Limited edition TFC merchandise will also be available at the TFC booth for lucky promo participants. Enjoy a fun-filled weekend with Vice Ganda and guest comedians in “Pusuan Mo si Vice Ganda sa Korea: Nagmahal. Nasaktan. Nag-concert.” For more details about the show, visit facebook.com/TFCKoreaOfficial. Connect with fellow global Kapamilyas and follow @KapamilyaTFC on Twitter and Instagram.